Painter of seascapes, landscapes, architecture and still-lifes; engraver. Robert Mols was the son of Florent Mols. A pupil at the Antwerp Academy of Fine Arts, Mols was awarded numerous prizes from the age of thirteen. At seventeen, he left for France and worked at the Ile Adam with Julien Dupré. Around 1868, Mols worked in Barbizon where he became a pupil and friend of Jean François Millet. At that time, he was painting rather dark landscapes. From 1870 on, he turned to painting exclusively seascapes, which he executed in lighter tones. He then worked with Antoine Vollon. He visited Italy, Germany, France, England, Turkey and Bulgaria. Mols looked for inspiration around the French coast where he lived throughout the year, as well as in the ports of Rotterdam and Antwerp. 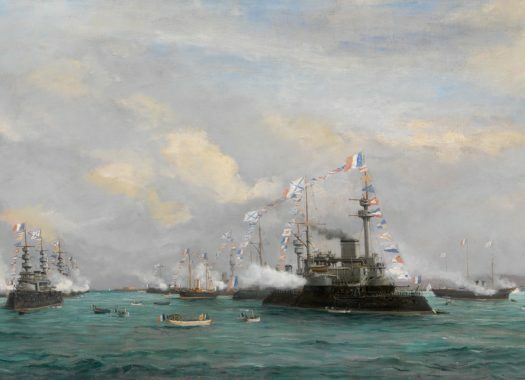 When Tsar Nicolas II arrived in France, Mols was assigned to Cherbourg to make sketches of the French fleet’s manœuvres. He often exhibited at the Salons from 1873 onwards. Mols was also a remarkable panorama painter. In 1894, in collaboration with Piet Van Engelen, he painted the Congo Panorama, which met with great success at the Antwerp Exhibition. Mols received numerous awards and decorations during his lifetime, including the Cross of the Order of Leopold in 1879. He was made Chevalier of the Légion d’Honneur in 1900. P. & V. Berko, "Dictionary of Belgian painters born between 1750 & 1875", Knokke 1981, p. 476- 477. P. & V. Berko, "Seascapes of Belgian Painters born between 1750 & 1875", Knokke 1984, p. 107- 110.